I was contacted by Block Island Organics about reviewing their products. It was a timely offer, being that it is Summer and we've recently discovered that Spencer has PMLE (Polymorphous light eruption - he's allergic to the sun). I was also moved by the fact that Block Island Organics is a very small company, founded by a brother / sister team. Like Block Island Organics on Facebook. Follow Block Island Organics on Twitter. Complimentary products were provided for review. 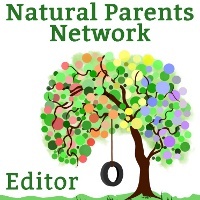 This post contains affiliate links that support this blog at no additional cost to you. Thank you! 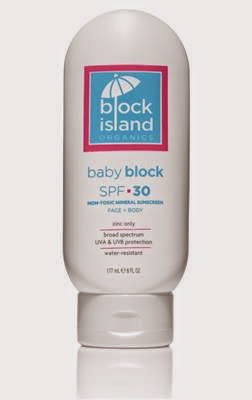 The main item I tried (several times) was the Baby Block SPF30 Sunscreen. It is described as "a zinc only organic, lightweight, non-nano and mineral based sunscreen safe for babies over 6 months and sensitive skin types." It was important to me that the sunblock is nano particle free, but it is also non-comedogenic, vegan formula, paraben free, and phthalate free! It contains no artificial fragrance at all (I hate perfumes). It is not tested on animals and its made in the USA. Lots of winning reasons to love it... as long as it works! Our first trial of baby block was on the 4th of July. It seemed a good time to really put the product to the test. I was a little nervous trusting Spencer's PMLE to sunblock instead of just limiting sun exposure, but it was a holiday and we had company coming to hang out in the back yard. This sunblock absolutely absorbed easily into my son's skin and left barely any oily residue on my hands at all. (Don't you hate that part?!) It didn't stink or pile up on top of our skin. As you can see (and in case you're new here), Spencer has very fair skin. I only applied Baby Block one time, before we headed outside. I would say that he spent approximately 3 daylight hours playing outside. He did not burn at all. (Its the burn that later turns into a rash with his PMLE.) I also applied this product to my two-day-old tattoo. I really slathered it onto my fresh tattoos! On another occasion, I tested Baby Block on a zoo trip. We only stayed there for 2-3 hours. Again, no burn! I absolutely recommend this product to friends and family! I love to support small business and the product performs as promised. Block Island Organics also makes 3 other sunblock products with varying SPF ratings. I will say that calling it "zinc only" seemed misleading, but honestly: using nothing but zinc would not have been the same pleasant experience at all. It has to be in a carrier / cream. I will continue to trust my son's delicate skin to Block Island Organics, as well as my entire family's skin! Just don't use sunblock on fresh tattoos! You can purchase your own Baby Block through Amazon or directly from Block Island Organics (who offers free shipping on all orders over $50). This product (6 oz) will run you $24.99, regardless of which source you choose. A little really does go a long way, though. And just for Momma Jorje readers, Block Island Organics is giving a 20% discount on all orders from now through 8/07/2014. Enter code jorje during the ordering process. This code may not be combined with other special offers. Disclosure: I received a free sample for review purposes. I try to seek out only products I think you would find relevant and useful. If I don't like a product, I won't recommend it.